Lead generation and marketing evolve constantly with the rapid changes in technology. Digitalization has given rise to new techniques and strategies to generate sales leads. The constant developments in sales and marketing have made B2B lead generation campaigns become more effective. With the rise of advanced lead generation tools and targeted lead generation services, you can now automate your entire lead generation process. The daily advancements in the digital sphere have impacted every field and have given rise to more effective and resourceful new techniques. It is hard to help yourself updated with such developments. It is also hard to find a reliable source to learn and discover such techniques so you can implement the same to make your sales and marketing campaigns more effective. To fill in that void, there are various lead generation blogs that are authored by experts who leave no stone unturned in the lead generation sphere. Bringing you constant news, latest resources, new ideas and much more, these lead generation blogs prove to be the ultimate source to make your lead-gen process the most effective. A lead generation blog started by Brian Carroll, a best-selling author, Evangelist and a Speaker. This blog as the name suggests focuses on B2B lead generation and also, demand generation, B2B marketing, B2B Telemarketing, Inbound Marketing, Social Media, ROI Measurement, Marketing Strategy and much more. This blog goes in depth, giving you actionable tips, fresh ideas and free resources, all focusing on lead generation. The articles are authored by Brian Carroll himself and also by Content Marketer Andrea Johnson and David Green who has over 25 years of experience in all aspects of lead generation. In addition, Brian Carroll also puts out lead generation content in the form of podcasts which feature interviews with various experts in the sales and marketing field. You can also view various webinars which deliver insights on the problems and developments in the industry. Brian Carroll also has a bestselling book “Lead Generation for The Complex Sale” where he provides insights that help you identify ideal leads, align sales and marketing, build a strong pipeline, and effectively use lead-generation tactics. Debra DaCosta, the CEO and President of Direct Marketing Partners (DMP), who has helped shift the lead generation model from quantity to quality and market-ready to sales-ready, shares her expertise in this B2B lead generation blog. This blog provides you with proven tips, insights, and resources on lead generation and marketing. 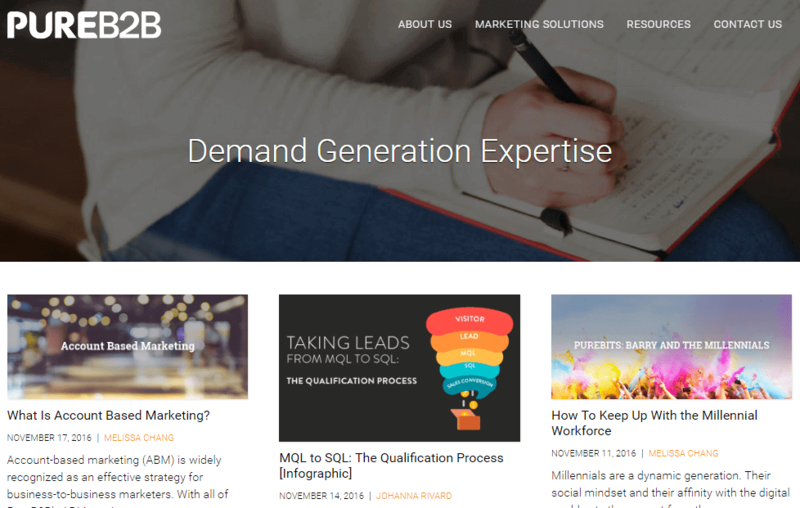 this B2B lead-gen blog aims to help you get your business more qualified leads than ever before. Other contributors to the blog include Tom Judge, DMP’s VP of Strategy & Business Development, Jose DaCosta, DMP’s VP of Call Center Operation, John Dandin who has nearly 20 years of B2B sales & marketing experience and much more. 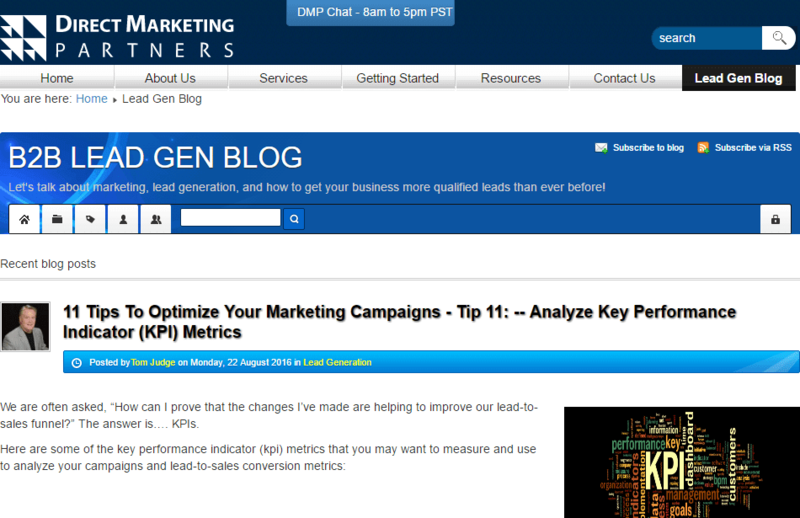 DMP’s Blog primarily delivers articles about lead generation and business services. In addition, this blog provides additional resources to help you understand and carry out lead generation in an effective manner in the form of whitepapers, case studies, industry data sheets and service info sheets. Dan Steler, better known as B2B Lead Gen Guy, is a Software Copywriter and a Lead Gen Specialist who lives and breathes B2B. He aims to help clients turbocharge their leads with simple plans. B2B Lead Gen Guy Blog gives you Dan Steler’s take on the world of B2B lead generation and marketing. This blog provides to be a resourceful medium for lead generation as he shares his experiences, learnings, observations, actionable tips, simple tricks and more. In his roughly 10min read articles, he provides extensive B2B lead gen and content marketing insights. He provides additional resources to help B2B marketing and lead generation in the form of reports, case studies, white papers, cheat sheets, questionnaires and more. This B2B lead generation blog also expands to deliver quality insights on blogging, content marketing, content promotion, email marketing, marketing, website lead generation and more that cater to the B2B world. 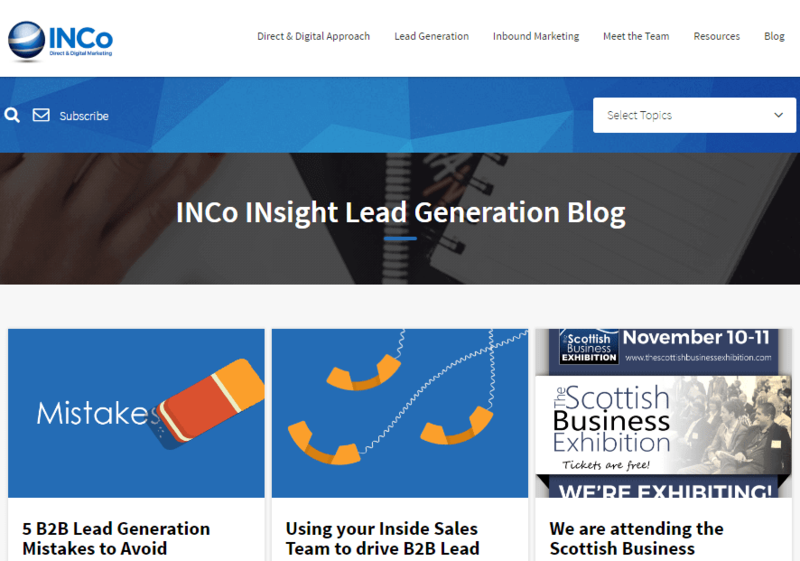 INCo Blog is a lead generation blog that brings you quality insights to help you with your lead generation campaigns. It focuses on enabling you to convert leads, close opportunities and grow your sales pipeline. It aims to provide you with everything you need to know to align inbound marketing and outbound strategies to optimize your lead generation. This lead generation blog features news and insights about outbound marketing, direct & digital marketing, inbound marketing and more. The articles are written mostly by Sarah Pringle who is an Inbound Marketer and Kristy who is an Inbound Marketing Manager. INCo also extends their resource delivery with eBooks and Guides & Checklists which aims to help you master and optimize your B2B lead generation techniques. ClickBack’s blog is a B2B lead generation blog that is maintained and authored by the ClickBack Team. These articles provide insights and tips to help understand better the various processes through which lead scan be successfully generated. This lead generation blog focuses mainly on generating leads through email and via a website. It sheds light on the various constraints you face while carrying out various lead generation campaigns and strategies. It also provides actionable tips on how to generate quality leads quickly, what are the factors to consider while purchasing leads, email list management, coining email subject lines, how to deal with purchased leads, lead nurturing and more. This is one of the lead generation blogs that deals with lead generation through content, SEO, email campaigns, growth hacking and much more. ClickBack B2B lead generation blog provides valuable insights on a regular basis showcasing their 16-year experience in the industry. Pure B2B provides B2B marketing solutions that help fill your demand generation funnel with B2B marketing solutions that drive engagement at all stages of the funnel. It helps fill your pipeline and drive ROI. Pure B2B’s blog specializes in demand generation and lead generation and provides you with detailed insights on how to make your lead generation campaigns and strategies more efficient. It also provides actionable tips such as how to make leads easier for sales teams to close, how to use psychology to convert more leads, how to leverage data-driven marketing to generate leads, how to turn your blog into a lead generating machine, how to lose a lead in 10 ways and more. The blog is regularly maintained and mostly authored by Johanna Rivard who is a Demand Generation, Content Marketing & Database Marketing Leader and the Executive VP of Pure B2B. She aims to help businesses exceed ROI with successful B2B lead generation and database marketing programs. Pure B2B provides additional resources in the form of whitepapers and videos that shed light on topics such as lead generation, content marketing, email marketing, account based marketing and more. ReallyB2B is a marketing agency that delivers business success by taking into consideration the key metrics such as leads, sales, and ROI. 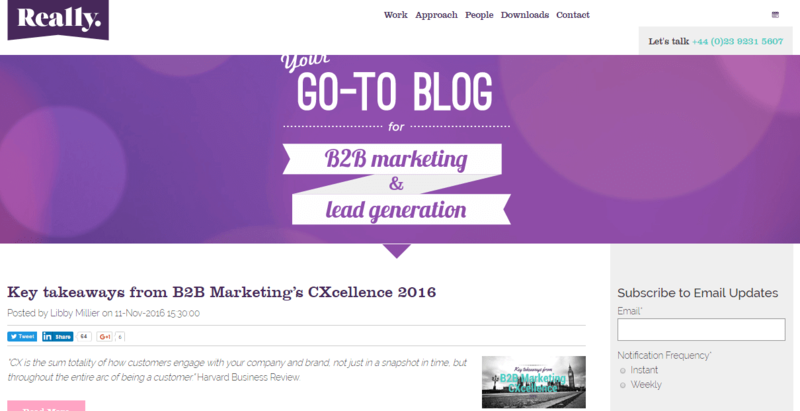 Their blog aims to be the go-to blog for all your B2B marketing and lead generation needs. 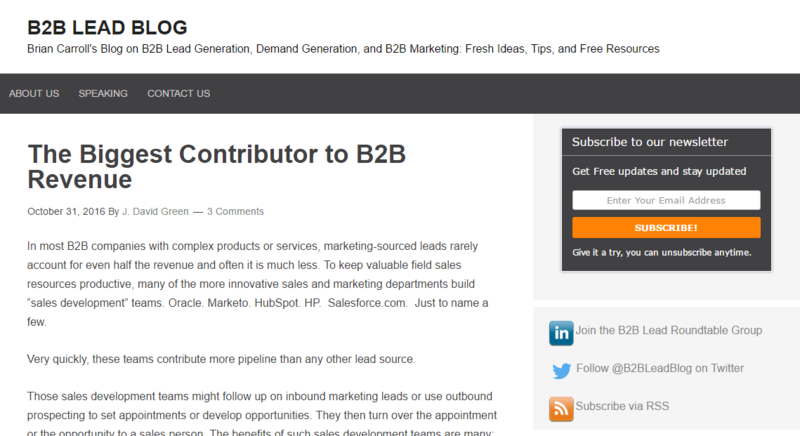 This B2B marketing and lead generation blog delivers quality content that is both fun and insightful. Fun, because this blog references the various holidays and occasions to help better understand various topics like Align your B2B sales and marketing like the Olympic GB synchronised diving team, Bringing Dead B2B Marketing Leads Back to Life This Halloween, Is Your B2B Marketing Story Good Enough to Win An Oscar? to name a few. The prominent authors are Kenneth Connolly who is the Head of Content at ReallyB2B and Libby Millier. The two provide a fresh take on the industry’s lead generation hassles, future projections, actionable tips and successful techniques & strategies. ReallyB2B offers sales manuals, B2B scrapbooks, lead generation guides, videos, eBooks, case studies, infographics and more that aim in providing you with more knowledge in B2B marketing and lead generation. MovingDNeedle is a B2B lead generation company that helps start-ups and companies generate leads. 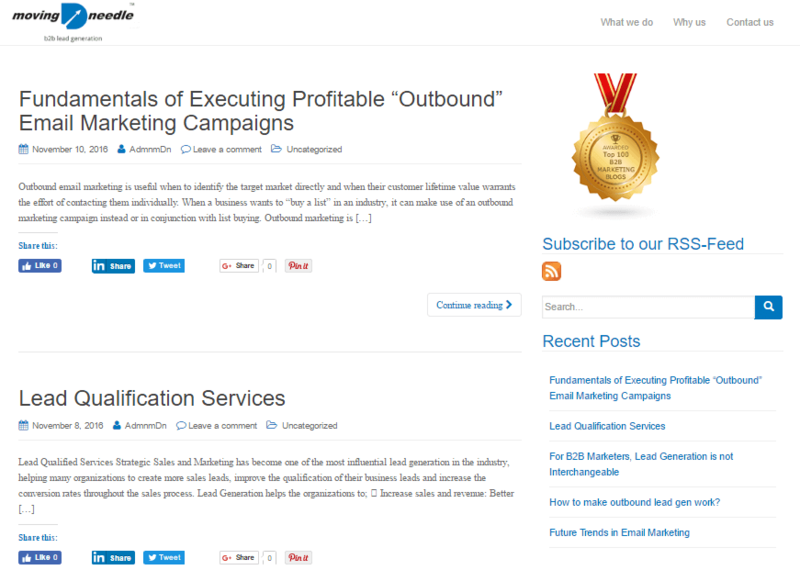 Its blog is awarded Top 100 B2B Marketing Blogs by FeedSpot. This blog provides in-depth insights on lead generation, B2B marketing, sales, email marketing, outbound lead generation and more. The articles are authored by the team at MovingDNeedle and give valuable information, and actionable tips on various challenges faced in the B2B sphere. This blog aims to help you overcome challenges, implement successful strategies and make your marketing and lead generation processes more efficient. With topics such as How Effective Sales Strategies Close Deals Faster, How Marketers Should Handle Global B2b Email Marketing Campaigns?, Guide To Choose Best Outsourcing Partner For Your Lead Generation, Best Practices For Email Marketing Subject Lines, the MovingDNeedle blog drives to provide quality content that benefits B2B marketers and help strategize better. Additionally, MovingDNeedle provides case studies, webinars infographics and more to help B2B marketers understand the world of B2B marketing and drive ROI. 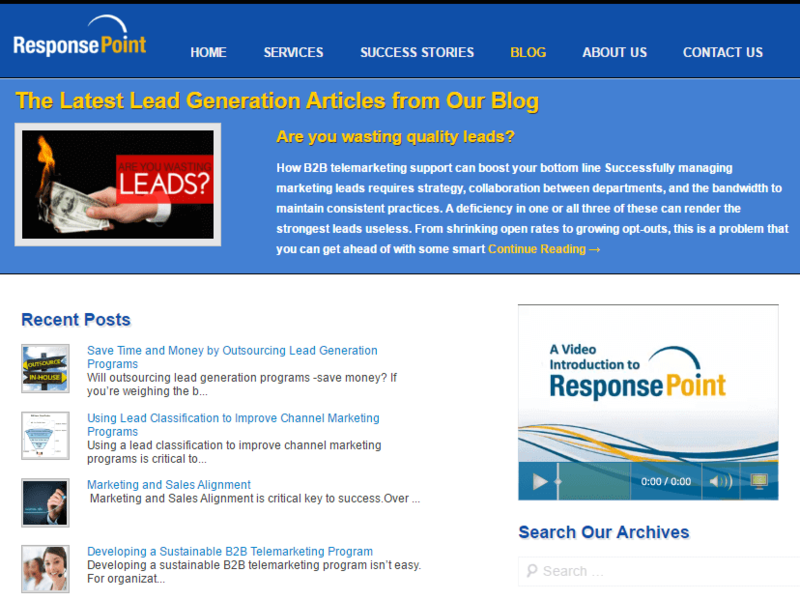 ResponsePoint Blog provides the latest insights on lead generation to help make your lead generation techniques and campaigns more efficient. This blog aims to provide a solution to the various problems that is faced in lead generation, lead nurturing and market profiling. With quality articles like B2B Lead Generation Needs to Be Revenue Focused, Building a B2B Lead Generation Campaign That Works, Save Time and Money by Outsourcing Lead Generation Programs, Are You Wasting Quality Leads?, to name a few, this lead generation blog provides actionable insights and tips that help you achieve the best results with your lead generation campaigns and strategies. The blog is maintained and authored by ResponsePoint Team’s Ted Seward who is Director of Marketing and Business Development who has over 20 years of experience in marketing and sales. He shares his expertise in these various blog articles at ResponsePoint and aims to help clients align their marketing & sales for measurable acceleration and growth leveraging inbound & outbound lead generation strategies. 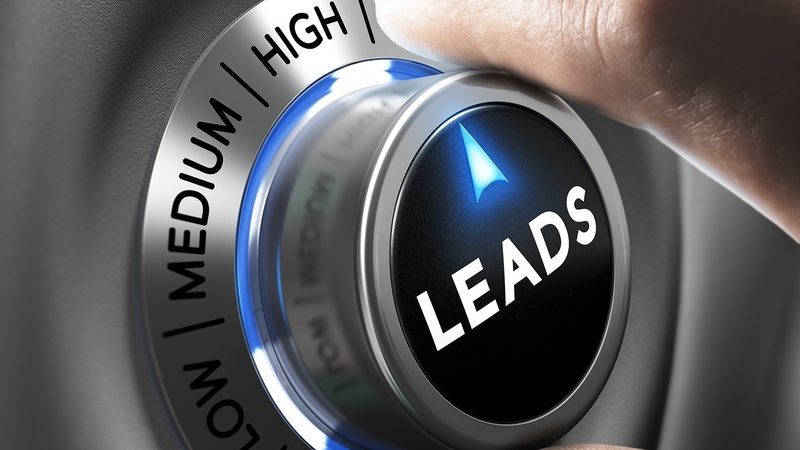 This lead generation blog aims to help you identify, nurture and capture leads to drive sales. As the name suggests, this is a B2B lead generation blog that provides lead generation and list building tips. This blog is based on the simple value that better business begins with better leads. 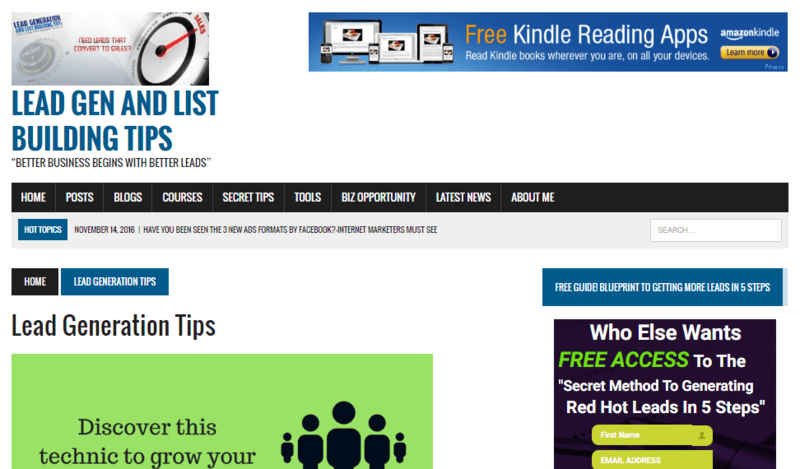 LeadGen And List Building Tips blog is owned and maintained by Raylon Williams. Through articles such as Lead Generation On Facebook And Why You Should Use It, Lead Generation And Management- What Is It Really?, Hey Take That PPC And Shove It! – Banner Ads Are An Awesome MLM Lead Generator and Here Is A Guaranteed Tips For Website Traffic, to name a few, he shares his take on the prevailing lead generation techniques and strategies. He tackles the various ongoings in list building with articles like Did You Know You Can Build Your List Through Newsletters?, How To Build Your List Using Blog Posts And Articles and 4 Effective Tips To Build Reliable List (List Building). Raylon Williams also offers a free guide which serves as a blueprint to get more leads in 5 steps. 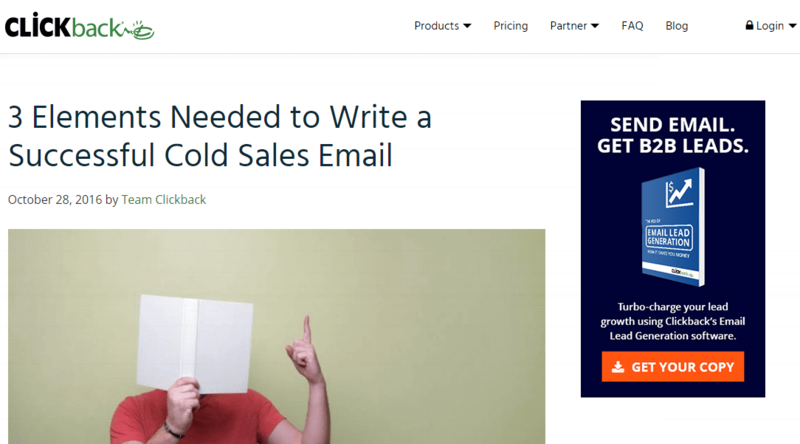 These are some of the noteworthy lead generation blogs that help B2B marketers in carrying out various functions efficiently. Comment below and share with us, your favorite lead generation blogs. Digital Marketer keen on helping companies and brands establish & grow through social media. Helps empower startups and entrepreneurs through effective inbound marketing, email marketing and social media strategies. Yeah, I follow B2B blogs,insights are very resoourceful.We use hybrid email marketing services which are business to business. vertical.These blogs are really helpful for me. I’ll also forward your post to my friends who also finding as well information over the web. Keep writing. 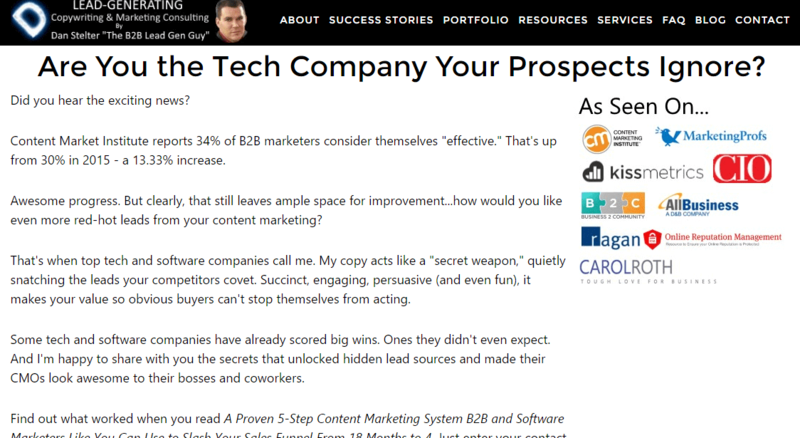 Great tips & super list of lead generation blogs. Buy Homes To Rent Out helps you to get the leads and buy the homes within your expectations. Superb list of blogs for lead generation. These tips will surely impart a great contribution for Find A Foreclosure Fast huge business success. Awesome tips, Thanks for sharing.